The last post on the Coolgreany Evictions Album focused on the eviction of the Darcy family from their lands in Ballyfad in the July of 1887. In all, more than 60 families, in excess of 300 people, had been forcibly evicted during that year. The Land League organisers of the Plan of Campaign had however planned for the possibility of a landlord refusing to negotiate a downwards rent and the eviction of the tenants. Using Plan funds, shelters called Campaign Huts were erected in the locality on the land of charitable neighbours, and used to house the families who found themselves homeless. Such huts were built in Coolgreany, many on the holding of the Kavanagh family. The Coolgreany album contains a photograph of a gentleman who is identified by the album’s compiler as the builder of the Coolgreany huts, a Mr John Tierney. About 30 people took shelter on the Kavanagh’s land, and in early September of that year a legal case to enforce the removal of the huts was taken by Captain Hamilton, the agent for the Brooke Estate, against Dora Kavanagh. Their argument, as reported in the Irish Times, was that their presence was ‘an interference with the agricultural character of the land’, and in Hamilton’s evidence he stated that the people were ‘unpleasant to him, and that his great object was to get rid of the nuisance of the people in these huts’. Later that month, while this case was still ongoing, the matter came to a head. On 28th September, on the order of Captain Hamilton, Bailiff George Freeman and 17 other men, known as Emergency men – the enforcers of the landlords’ Property Defence Association, arrived at the Kavanagh’s farm. Their objective was to collect one year’s rent from the Kavanaghs, who at this time had provided shelter for ten families in the outhouses in the farmyard. The Kavanagh’s interest in the holding had been sold by the Sheriff, and the rent to be collected had been accrued during their tenancy. A dispute arose between John McCabe, the leader of the Emergency men, and Michael Kavanagh when McCabe demanded £57, but would not produce the warrant. A crowd of evicted tenants gathered at the gate of the property, and as Emergency man John ‘Red’ Johnston tried to enter the yard by climbing the gate, John Kinsella, a 64 year widower, struck the gate with a pitchfork. Freeman, who had been standing nearby, immediately shot Kinsella with his revolver. As Kinsella fell dead, the Emergency men fired on the crowd, narrowly avoiding further casualties. As the tenants brought Kinsella’s body inside the house, the Emergency men seized the Kavanagh’s cattle in lieu of the rent owed. At an inquest at the coroner’s court the verdict was passed that ‘We find that the said John Kinsella came by his death at Coolgreany, in the county of Wexford, on the 28th September 1887 by a gunshot wound inflicted feloniously, maliciously, and of malice aforethought, by George Freeman, aided and abetted by John McCabe, John Harris, Henry Oakes, David Crawford, Samuel Scott, Thomas Olinging, T.R. McCawley, Moses Porter, Alexander Kingsbury, George Harris, John Levingston, John Johnston, James Rogers, John Johnston (Red), Francis Maguire, William Johnston, R.H. Maxwell, and E.C. Hamilton’. A number of men, including Captain Hamilton, were released on bail, but Freeman and nine others remained in custody in Wexford Jail. However, when the case came to trial all the men, including George Freeman, were acquitted of the murder. It is interesting to note that earlier that year, in February of 1887, Sir Thomas Esmonde put forward a question in the House of Commons enquiring about an incident involving Freeman on the 5th of that month. He and an Emergency man named Woods, also employed on the Brooke Estate, came to the village of Coolgreany and got drunk. When they were removed from the premises, they turned their firearms on the shop owner, a Mr Doyle, and were only stopped from firing by the police, who had come and managed to disarm them. Freeman was later bound to the peace for flourishing a revolver. ‘Sacred to the Memory of John Kinsella of Croghan, who was foully slain in defence of home and country by the bullets of the Property Defence Association on the 26th September 1887 in the 64th year of his age. This monument was erected by the men of Wicklow and Wexford as a testimony of their respect for his many Christian virtues and as an indignant protest against the cruelty and injustice of those who before God are guilty of his innocent blood’. Since first looking into the NMI’s acquisition of the Coolgreany Album, I have found that its donor stated that he had saved it from being burned about 16 years previously, in the 1920s, though he did not mention where. So though we do not know anything further about the provenance of this copy of the album, we know that it was very fortunate to have been saved. The images from the Coolgreany Eviction album, comprised of photographs of the infamous 1887 series of evictions in the Coolgreany area near Gorey in North Co. Wexford, are already fairly well known. The National Library of Ireland acquired a copy in 1992 from the grand-niece of Fr Laurence Farrelly, who was active in the Plan of Campaign in Co. Wexford in the 1880s. Some of the images were used in the NLI’s wonderful Notice to Quit exhibition in 2003, so are very familiar to some. A letter that came with the donation identifies a T. Mallacy as the compiler of the album (and also probably the photographer), which he gave to Fr Farrelly in 1888. The National Museum also acquired a copy of the album in 1942, compiled in the same manner and probably at the same time as the NLI’s. This copy has handwritten captions on some of the images, identifying the people and places, though we do not know who wrote these captions. A particular set of photographs stood out for me; the photographs of the 80 year old Mrs Darcy, taken at her sick bed in the process of her eviction from her home in Ballyfad, Coolgreany, in July 1887. Many photographs of evictions are of the eviction scenes themselves, or depict evictees posing outside houses for the camera. The photographs of Mrs Darcy are taken inside her home, making them look quite dark and despairing, yet there is also an air of defiance in her face. Mrs Darcy’s home, a five-roomed farmhouse with seven outbuildings, was situated on the Brooke Estate; lands owned by the wealthy Dubliner George Frederick Brooke, Wine Merchant, High Sheriff and Justice of the Peace. Brooke lived in Castleknock, Co. Dublin, and his estate was managed by Captain Hamilton. The Plan of Campaign (where tenants withheld rent from the landlord until a rent reduction was negotiated and agreed) was adopted by the tenants on the Brooke Estate in December 1886. The terms were refused by the owner, and in February 1887 Hamilton was preparing for a series of evictions. The eviction campaign started in July of that year, and numerous families (many of whom are photographed in the album) were removed from their homes by force by Hamilton’s bailiffs and Emergency Men. When Hamilton and his men came to the Darcy household, they found Mrs Darcy on her sick bed. The photographer captures some moments inside the cottage. In one, Daniel Crilly, the Irish nationalist M.P. for North Mayo, consoles Mrs Darcy, and another shows Mrs Darcy with her daughter. Despite the situation, Mrs Darcy remained strong. One image of her, with her hands clasped, is captioned ‘From the sick bed Mrs Darcy tells Captain Hamilton to evict her; her terms are ‘no surrender’. Another photograph shows a crowd gathered outside her cottage, described by the caption writer as ‘A council of war over Mrs Darcy’s eviction’, including friends and enemies. A crowd of onlookers are seen on higher ground, being kept back from the house. Members of the Royal Irish Constabulary, armed with rifles, can be seen to the far left. In front of them are leading nationalists Daniel Crilly M.P., John Dillon M.P. and Michael Davitt. Captain Hamilton, the evicting agent, is seen leaning on his stick talking to Captain Slack, the magistrate in command. In the background a group of Emergency Men are waiting for the word. The caption also reads that Captain Hamilton receives a telegram, and postpones the eviction. The delay to the Darcy’s eviction did not last long though, and a later photograph shows Miss Darcy gathering up her furniture after eviction for conveyance to the Campaign Cottage (cottages set up by the Plan of Campaign as shelters for evicted tenants). The Darcy family did manage to return to their home eventually. The 1901 census shows William, John and Catherine Darcy living in house number 2 in Ballyfad where they are running a post office and shop. The land was still owned by George Brooke at this point, but the passing of the Wyndham Land (Purchase) Act in 1903 meant that Irish tenant farmers could now buy the title to their land, and in 1911 John Darcy is listed as the landholder, and his brother Michael owns a neighbouring house and farm. Coincidently, the oldest son of George Frederick Brooke, a Lieutenant George Brooke of the Irish Guards (1st Battalion) and his wife Nina were also resident in Ballyfad, alongside the Darcy family in 1911. Sadly, George was killed aged just 37 in the First World War in Northern France just a few years later in October 1914, and is buried in Soupir Communal Cemetery. 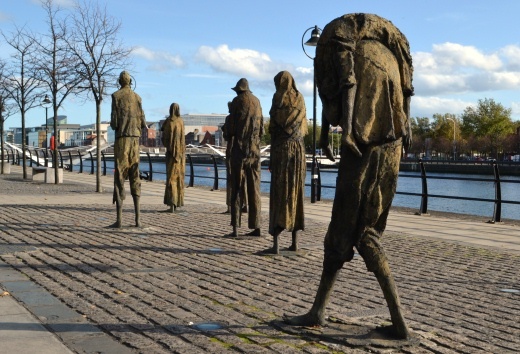 Today is National Famine Commemoration Day in Ireland, an event which has been held annually since 2009. Though it seems little remains of any material culture relating to the famine, the National Museum has a small number of ‘famine pots’; large iron pots used to cook soup in the kitchens set up by the Quaker community to feed the starving. A number of these pots survive around the country. Another object from the museum’s Historical Collections is this Indian meal ticket, issued by the Portlaw Relief District in Waterford to a Mr White, enabling him to purchase three stone of Indian meal for six pence. It was found in the Carrick Road area of Portlaw, and was given to the museum in 1952. Ireland has seen much famine in its history, but the most well-known is the period between 1845 and 1852; the Great Famine. During its course it is estimated that between one and one and a half million people died of starvation and disease, and a further one million people emigrated. The 1841 census of Ireland had recorded eight million people, making the loss during these famine years at least 25%. The population continued to decline over the decades, and the pre-famine population levels were never again seen in Ireland. The famine was caused primarily by the potato blight that caused the potato crops, on which so many Irish people were dependent, to fail in the autumn in 1845. Other crops were unaffected and Ireland continued to export food to England during the course of the famine, in many cases escorted under armed guard from famine stricken areas to the ports. In November 1845 The Relief Commission was established to assess food shortages and the levels of distress in the country. At the same time, the British Prime Minister Robert Peel arranged the import of cheap Indian cornmeal, which could be sold at a reduced rate. Local relief committees were set up to raise funds, which would be partially matched by the Commission, to buy the cornmeal and sell it at cost price to poor families, as they were restricted from providing the meal for free to any person unless they were unfit for work but could not enter a poorhouse. The cornmeal didn’t arrive in Ireland until February 1946. The Illustrated London News (4th April 1846) carried an artist’s sketch and account of the selling of the Indian meal in Cork. ‘On Saturday last, the Government Sales of Indian Corn and Meal commenced in Cork. Immediately on the depots being opened, the crowds of poor persons who gathered round them were so turbulently inclined as to require the immediate interference of the police, who remained there throughout the day. Among the poor, who were of the humblest description, and needing charitable relief, the sales were but scanty. The occasion had become of necessity; for potatoes have risen to 11d market price for 14lbs. ; and, some of the leading commercial men in Cork have made a calculation, which shows that the Government can afford to sell the Indian Corn at a much cheaper rate’. The Indian meal posed its own problems though; it needed to be ground twice before it could be eaten so it required substantial processing. Most importantly, it was a poor dietary substitute. The staple diet of potatoes that the poorer Irish were used to was quite nutritious, but the Indian meal lacked Vitamin C, leading to many people developing scurvy. However, the meal undoubtedly did help reduce the death rate by starvation in that year. The supply of the meal was gone by June 1846, and Peel’s government had fallen, replaced by Charles Trevelyan. The potato crop continued to fail, no more Indian meal was purchased, and the famine continued and worsened. 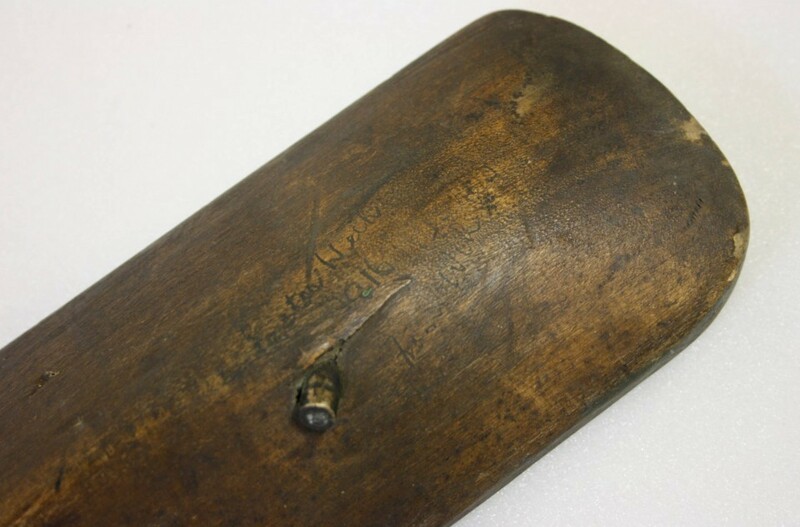 This small ticket is not only one of the few surviving objects of the Great Famine, but an incredibly personal one. The Waterford area may not have been the worst afflicted by the famine, but the people there were affected. We don’t know who Mr White is, but this ticket, which must have been given to him in the first year of the famine, identifies him and his family as in need of the aid provided by the local relief committee. We will probably never know what happened to him in the following years, if he died during the famine, or had to emigrate. It’s also possible that he survived, perhaps with descendants still living in Waterford. 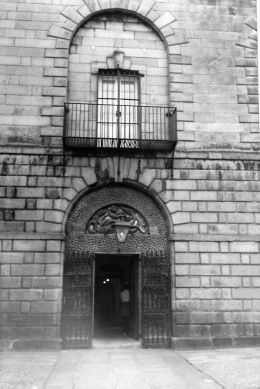 Kilmainham Gaol may be best known to many people as the location of the imprisonment and executions of the leaders of the 1916 Rising, but the prison was the scene of many executions before then. Built in 1796, it became the centre of execution for the city of Dublin, and over a hundred people were put to death there for crimes ranging from murder and treason to theft. This death warrant of Patrick Kilkenny, who was publicly hung in the front yard of Kilmainham on 20 July 1865, tells the story of the murder of a young woman named Margaret Farquhar in a crime of passion, and was donated to the museum in 1949 by a relative of Thomas Flewett, Deputy Governor of the gaol. On the morning of Saturday 10 June 1865, a 40 year old farm labourer named Patrick Kilkenny arrived at the police station at Beresford Place to confess to the murder of 26 year old Margaret Farquhar from Co. Meath the previous evening at Palmerstown. After a short search, the police found Margaret’s body in a ditch, face down in the water and covered with grass and weeds. It seems Patrick and Margaret had had a courtship of sorts over a number of years; Patrick regularly called to her family house and they were often seen at dances together, though no engagement was ever announced. Patrick was described in the newspapers as a low-sized, stout and muscular man with the character of a drunken bully, while Margaret was reported as being considered the best looking girl in the parish. Just days previous Margaret received a letter from an ex-suitor, an Englishman who had emigrated to America for a new life and was now offering her marriage. Patrick, on hearing the news, strangled and drowned her in a roadside ditch, then sat by her body before handing himself in to the police the next day. On 19 June, coming up to Kilkenny’s trial, The Irish Times expressed its suspicion that it was insanity, rather than jealousy, that caused the murder. It urged careful consideration of the case to avoid the execution of a man for a murder similar to two recent incidents where the accused, both of a higher social class than Kilkenny, did not receive the death penalty. The cases they referred to were the Townley Murder in England in 1863 and the O’Dell Murder in Dublin in 1864. In the English case, George Victor Townley, a 25 year old from a respectable upper middle class family, stabbed his fiancé Elizabeth Goodwin when she broke their engagement. He was tried, found guilty and sentenced to death, but his family’s money and influence allowed for Townley to be later found insane and his sentence was commuted to life imprisonment. He committed suicide in prison in February 1865. William O’Dell, a 55 year old former barrister and employee of the Fine Arts Department of the Royal Dublin Society, confessed and was convicted of the murder of Bailiff Richard Fox in October 1864. Fox had come to O’Dell’s home at 91 Upper Rathmines Road to collect goods to the value of £8 in lieu of rent arrears, and as he was leaving the house O’Dell fired his revolver, shooting Fox in the head. He was found by the jury to have suffered a ‘paroxysmal mania’, or a fit of mania, and he escaped the death sentence. Patrick Kilkenny’s fate was to be different. The jury found him guilty and, despite their call for mercy, Judge Baron Deasy passed the death penalty with the statement ‘Actuated apparently by the passion of jealousy, you struck down to death that unfortunate young girl that was the object of your love. For that, through that passion, two lives are sacrificed’. On 20July 1865 Kilkenny became the first recorded hanging in Dublin since the execution of John Delahunt, the murderer of 9 year old Thomas Maguire, in 1842. The Delahunt execution reportedly drew a crowd of 20,000 people, and Kilkenny’s execution, which took place on the drop-platform balcony over the main entrance of the gaol, also attracted a large crowd of spectators. The Freeman’s Journal questioned the practice by asking what comfort it could give the family of Margaret Farquhar as it would not restore her life to her, stating that it was not a deterrent to crime, and also calling public executions a revolting and abhorrent spectacle which disgraced Dublin. The newspaper describes the execution scene in detail with no attempt to disguise its distaste. ‘The novelty of an execution taking place within our city invested the sad scene of Thursday morning with a peculiar and an unusual interest for numbers of that idle and degraded class which is sure to be found in large communities – a class whose morbid love of the terrible, the exciting, the cruel and the sensational is in strange and strong antagonism with the much vaunted civilization of the time. A kind of semi-love romance which was sought to be imported into “The Palmerstown Murder” to some extent contributed to induce the wanton curiosity-monger, the professional sight-seer, the indolent, the vicious, and the depraved to be present at the last act of the fearful tragedy, and as a consequence vast crowds continued to pour from all parts of the city and surrounding suburbs from an early hour this morning and take up their positions in front of the jail or wherever a good view could be obtained of the place where the dread sentence of the outraged law would be carried out’. One hour after the hanging, Patrick Kilkenny’s body was cut down and interred in the grounds of Kilmainham. Three years later the Capital Punishment Amendment Act was passed, which required all executions to be carried out within the walls of the prison in which they are interned. This saw the end of public executions in Ireland and the UK. In 1868 John Logue, a convicted murderer, was the last person to be publicly executed in Ireland. However, capital punishment remained common even past the formation of the Irish Free State and Republic. The last execution took place in Mountjoy Jail 1954; that of 25 year old Limerick man Michael Manning who raped and murdered a 65 year old nurse called Catherine Cooper. From that point, any death sentence passed was commuted to life imprisonment by the President of Ireland, until 1990 when it was finally formally abolished. It is now prohibited in the Constitution, and cannot be re-introduced even in the case of war or a state of emergency.